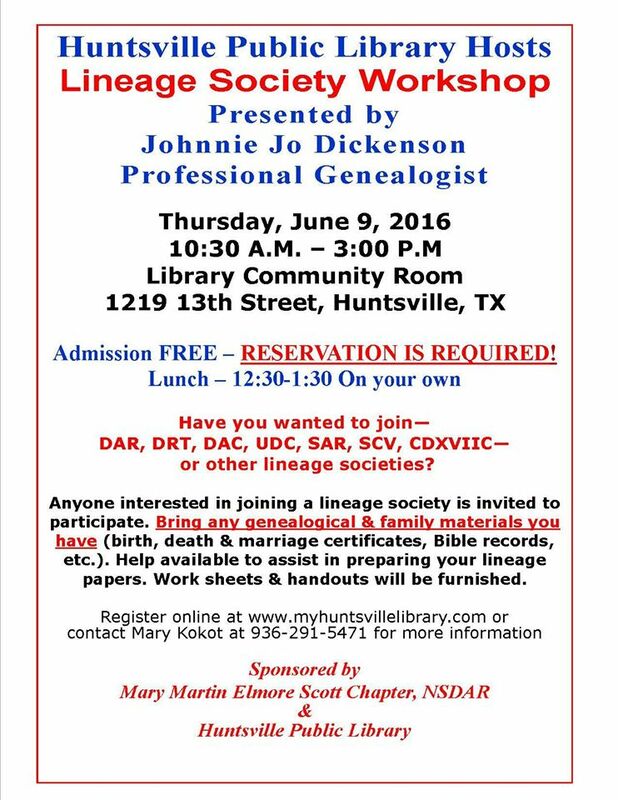 The Huntsville Public Library will host its 25th annual Lineage Society Workshop from 10:30 a.m. to 3 p.m. Thursday, June 9, and the public is encouraged to attend. The workshop will be held in the Community Room at the library, located at 1219 13th Street, and will offer assistance in preparation of lineage applications to any patriotic or lineage society (women and men). Attendees will have an hour for independent lunch from 12:30 to 1:30 p.m.
“Anyone interested in joining a lineage society is invited to participate,” said Mary Kokot, Adult Services. “Bring any genealogical & family materials you have, i.e. birth, death, and marriage certificates, Bible records, land records, etc. The workshop is taught by Johnnie Jo Sowell Dickenson, Professional Genealogist, and is sponsored by the Mary Martin Elmore Scott Chapter, Daughters of the American Revolution and the Huntsville Public Library. Admission is free, but pre-registration is required. To attend the workshop and receive the handouts and worksheets, interested parties can register at the library or online at www.myhuntsvillelibrary.com . For any additional information, call Kokot at 936-291-5471.